Deep in the heart of northern Asia, tucked between Mongolia and Siberia, amid dense taiga forests and grassy steppe, lies Tuva. It is a small country of fewer than 300,000 people, most of whom are semi-nomadic shepherds, hunters and reindeer herders. For many Tuvans, life is lived as it was by their ancestors. Isolated from the rest of the world for millennia, it is only in the last century, when it was incorporated into the USSR, did the country begin to modernize. Still, there are few roads outside the capital, Kyzyl, and the traditional horse culture prevails. Inside this inaccessible land, a unique form of harmonic overtone singing evolved, called xöömei, (of which there are many styles) in which two or three different pitches are produced at once. The sounds often mimic nature – singing birds, thundering herds of horses, winds whipping through the forest trees. The songs relate tales from the lives of herdsmen and hunters, from their love lives to their travels to their daily routine. Huun Huur Tu, aka The Throat Singers of Tuva, have been the emissaries of Tuvan throat singing since the early 1990's, giving concerts throughout the U.S. and Europe, amassing more devoted fans at each recital. 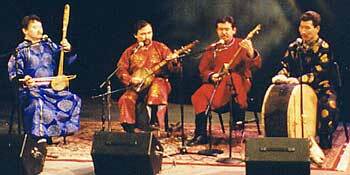 This group of four members – Sayan Bapa, Kaigal-ool Khavolyg, Anatoli Kuular and Alexei Saryglar – are again on tour, and performed on Saturday, March 1 in Symphony Space, in New York City, through the World Music Institute. 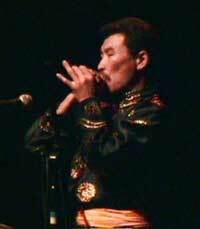 Each performer is an expert in a different style of throat singing, and accompanies himself on one or more indigenous instruments, such as mouth harp, stringed lutes and fiddles, and/or percussion. Although Huun Huur Tu are certainly masters of this style, according to group member Sayan Bapa, theirs is not a unique ability among their countrymen. Almost all Tuvans learn these harmonics from the time they're first able to speak. Although it takes a while to learn, a few western singers, too, have become proficient in xöömei. 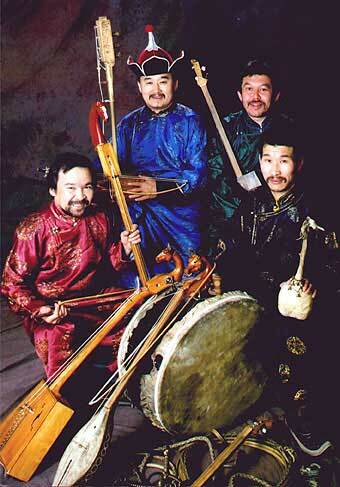 While impressionism came to Western music only in the last century (think of Grieg's "Peer Gynt Suite," with its famous sounds of dawn,) Tuvan music has always been such. Although the poems, themselves, convey stories, (just as there is a plot line in "Peer Gynt,") the sounds within describe the settings of these sagas. According to ethnomusicologist Theodore Levin, they represent "sonic 'maps' of physical landscapes." Although most Tuvans these days are literate in Russian, historically, Tuvan is not a written language and these songs were a way for nomads to record history and stories, and pass on information. According to Bapa, the tunes themselves have remained fairly consistent over the centuries, while poets of each era write new lyrics. There are even festivals featuring contests for new words to beloved, familiar songs. Most of the audience at Symphony Space seemed familiar with the group's music, including a surprising number of children who were in attendance. An obvious favorite was the group's final number, A-Shoo-Deki-oo, a rousing vocal and instrumental piece which conjures up horsemen thundering across the frozen steppe. This was my nephew's favorite song when he was a small boy, and he'd have me play it for him over and over. It has a lively, catchy cowboy flavor to it, which isn't surprising since, as many Tuvan songs, it's about horses. At the concert, Bapa, the only English-speaking group member, introduced each number. After a while, the audience laughed at his inevitable pronouncement that "this is a song about a horse." Backstage, he explained that while, yes, many of these songs are equine in nature, the horse is often a metaphor for a woman. 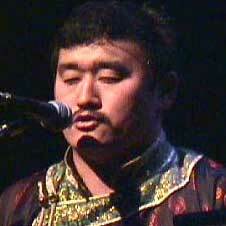 They are full of tongue-in-cheek "mounting" analogies and other double entendres – a Tuvan inside joke. Even without being able to understand a single word, however, a Huun Huur Tu concert is still a fun, upbeat mind trip to a different culture; one so different from ours, it seems, at times, to be from another planet.